LoanAdda is an online leading aggregator of financial products and services. It algorithmically stratifies lenders with borrowers in the bottom of the pyramid. Being a financial technology company, we enhance the probability of loan for under banked consumers by filtering customer data points with lender’s parameters and finds the right fit. We’ve taken the credit parameters of over 40 banks/ NBFCs/ MFis and put it together in a machine learning program and when we collate 58 data points of a customer’s creditworthiness, capacity and collateral to borrow, we connect the borrowers to right lenders. We believe that unlike the common perception, every customer need is different and every customer has a different priority. And that is why LoanAdda is revolutionizing the Loan marketplace in India by giving you the power to choose and tailor services according to your needs and requirements. Our experts are always on call to help you right till the loan disbursal. Backed by a team with top notch banking expertise, we are the only service providers bringing such a vast range of options to our customers. So whether it’s your dream home, dream holiday or your dream wedding, or anything you ever wished for but couldn’t achieve due to lack of finances, don’t worry as we, LoanAdda will make it come fulfill. We'll be Constantly in contact with you and with the applicable financial institution. 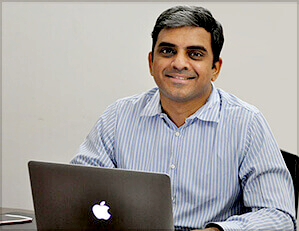 Anshuman Mishra brings to LoanAdda over 15 years of experience in varied sectors ranging from Banking, Consulting, Retail and Venture Capital. He has completed his education from prestigious college like Mayo College. He started his banking career with ICICI where he created structured securitization products like LAP, Gold Loans etc. He was most recently spearheading one of India’s first SEBI registered Social Venture Capital Fund. He has diverse experience in roles ranging from Analyst in Intangible Asset Valuation at Deloitte to Chief Financial Officer at Color Plus and EPIC Group, HK. He is also an Independent director in Hindware Retail Pvt Ltd (EVOK brand). He brings an exemplary understanding of the Personal Finance landscape in the country and has a Post Graduate Management Degree from INSEAD, Paris and IIFT, Delhi.